Fellow fish-head Josh and I payed it no attention. Sustained 25-35 with gusts to 60? Ha! Let's go fishing. Josh was kind enough to invite me to fish with him on Monday, which was good because I actually may not have gone otherwise. We fished water he hadn't been on before, but I had. A great little watershed with numerous wild browns and brook trout. Small streamers were going to be the name of the game, and within minutes Josh had hooked up and I had moved a fish. It ended up being a pretty solid day, all things considered. No trees fell on us, that was good. It was a little colder than had been predicted. The fish seemed to be turned on but not as fired up as I've seen them there on previous trips. An interesting development ended up being the productivity of flies that included wood duck. Josh got his first fish on a gold Empie Shiner, but that seemed to become unproductive shortly thereafter. I was fishing a miniature version of Domenick Swentosky's Half Pint... let's call it a quarter pint; I was drawing a lot of strikes on that fly. Eventually, having no others of that pattern, I lent an alternative to Josh: a Wood Duck Heron. He was soon into fish again. It can be kind of funny how a trout's preferences line up. Flash-less, light and naturally colored, and barred seemed to be a key on this day. The wind failed to impact our fishing much, though I spent more time looking for widow makers than I typically do. A couple trees went down while we were out there to keep us on our toes. But it was fun to be out on a day most others probably wouldn't have fished. Thanks Josh! For three winters now I have been fishing the same small CT river looking for one of the handful of quite large wild brown trout that inhabit it. It has been an exercise in patience, exhaustion, and learning. I can say quite comfortably that I still barely know anything about this stream and it's strange, seemingly indestructible trout. There aren't a ton of them, especially not the really big ones. The water gets unacceptably warm every summer, yet the trout persist. Their are large amounts of pollution sources throughout the watershed. There is drug paraphernalia all over the damn place. Which will I catch first, my 28 inch brown or hepatitis? Nymphing. Doesn't. Work. At least not any conventional style of nymphing. I've never seen a substantial wild trout rise there. But one cold February day I encountered a pool full of rising juvenile trout... after sunset. Last December I hooked and lost a quite large trout... at night, with temperatures below freezing. I've never seen a mayfly hatch, but the nymphs are there. This stream is so strange and so frustrating, and that's why I fish it as much as I do. I am FAR more likely to skunk out there than I am to catch even a 14 inch wild fish. Because of that, it holds my attention. I'm not looking for a sure thing anymore, I'm looking to catch the rarest fish in the river. 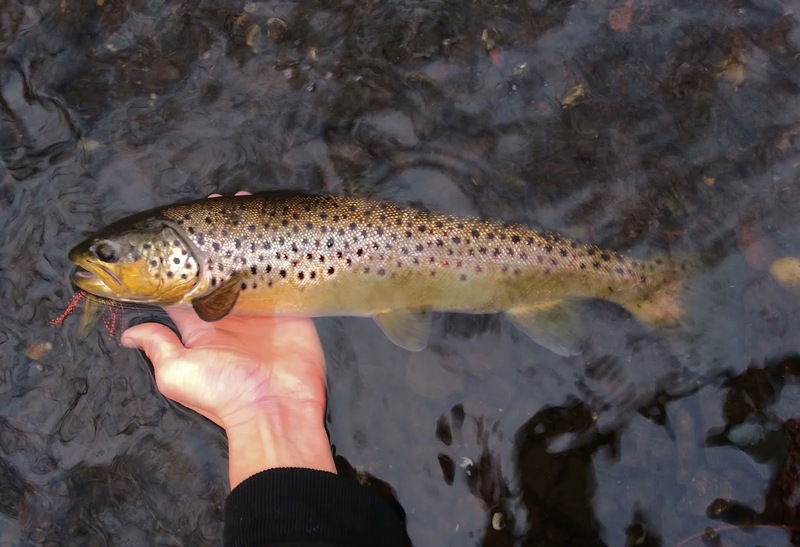 And this stream's 22-28 inch brown trout, of which there must be less than 10 in 10 miles, fit the bill. They are a challenge worthy of my time, though it may well take me another 3 winters to get one of those fish. I almost had one on Saturday. It was a near perfect day, with increasing cloudiness, pre-frontal conditions, above freezing, and a moderate flow. I even forgot to stick my memory card back in my camera and so only had my phone (I hate phone photography)... that is almost a guarantee that something spectacular is going to happen. I got so close. I had missed a few smaller fish spread throughout the just over two miles of river I had covered already when I came to a spot I had missed a 27-28 inch fish in last winter. In the very same spot, I came tight to a fish of the caliber I was hunting, a hen brown I'd estimate at 24 inches conservatively. It was a very heavy fish. It started out just head shaking, but coming up to the surface it started to alternate between death rolling and flailing violently. For 20 seconds it did this and I failed to gain control of it at all. The thrashing and rolling had exactly the effect the fish was going for: it wrenched that sharp thing out of its jaw and stopped that pulling force. That moment was gut wrenching. I felt like throwing up. My hands were shaking. I had been dealt yet another serious blow by this river, one of many. I kept fishing, hard and focused, but knowing full well I wouldn't get another chance. Not at a fish like that. And when I hooked a long, lean, acrobatic brown of 19 inches, it was all fine and dandy, but it didn't fill the hole I needed it too. I'm looking for one fish. One incredibly rare, smart, old fish. I almost had it, and this wasn't it. It ties place with another fish for the biggest I've caught in this river, but it was hard to feel like that fact carried much weight when the fish I had lost very literally carried a few pounds more. Whether fishing dries, wets, nymphs, or streamers for brook trout in the winter, I nearly always default to the dangle. It seems counter-intuitive, a dangled fly is far from subtle, and in many wintertime scenarios subtlety is preferred. But brook trout are not demanding. In fact, a dangled fly three feet above one's head seems to grab its attention better than a dead drifted fly six inches above its head. Strike detection is also aided. Wild brook trout in CT are generally small, and full of piss and vinegar as they are when the water is 50 degrees they are sluggish when it's below 40. Small and slow is not a good combo for feeling or seeing a take. Tight-lining isn't always an option in tight quarters and a rod held high may send fish running. It works on mid-sized streams, but in CT these are dominated by brown trout anyway. The same can be said for dead drifting with a slack line. It works circumstantially. Dangling flies, though, can get a lot done on small brook trout streams. On an outing in which Alan and I fished a quite small stream with some long, flat, curved glides and lots of overhanging brush, I was able to drop flies at my feet and dump line, maneuvering the rod tip to position the dangling fly in possible lies, hang it there for a few moments, then work it down to the next. By the end of that the fly was 30 feet downstream from me, around a bend, and beyond four small trees draped completely across the stream. Read the current, learn good line management, choose a fly with the right sink rate for the moment, and the sky is the limit with a dangled fly on a small stream. I put the dangled fly to good use on Friday in a high gradient stream that I hadn't visited in a while. The first fish actually took a twitched bomber cast upstream, but, believe it or not, I came back at the end and caught the same brookie on the same presentation that caught every other fish, a dangled Ausable Ugly. If "Ausable" is in the name, brook trout probably love it. The starting point on this stream is very near the lowest point, so there are two options, hop my way upstream and back down, or start as far up as I want and work down. I invariably choose to hop up and down. It gives me two shots at fish like the one I caught twice. Even an above average sized brookie is bound by the rules of low-nutrient freestone stream life: they must eat a lot of what enters their field of view. They can't afford to shut off for hours on end. So, if you miss or lose a nice brookie that you really want to get, give yourself the chance to come back to it, and expect it to have adjusted position slightly closer to cover. I sneaked around a good looking pool, taking care not to crack any branches or knock over any rocks, getting to the stream edge well above where I wanted to fish from. I did have to make sure I wasn't in sight of brookies in holding water in immediately upstream while doing so. I made short roll or bow and arrow casts, but the heart of the presentation was in line management and rod motions after the cast was made. Reading the current for ways to use it to manipulate my line was also paramount. The takes were subtle but far more easily detected than they would have been had I been fishing from a downstream position. It feel pressure when making a twitch or coming tight after a drop-back. Or, the fish would follow the fly upstream and I would watch it eat. The water is cold. The behavioral drift is minimal. The fish are hesitant to move. The quarters are tight. The casting is tricky. These are the times when the dangled fly shines. Never underestimate the dangle. There were fisheries here in New England not all that long ago that have practically been forgotten. Well up there is winter surf fishing. Hardly anybody is out there doing it anymore. I can understand why, it is brutal out there from mid November till March, and there aren't many fish left. The giant pollock fishery that used to exist at Montauk is almost non-existent. The surf cod fishery is pretty bleak. Tomcod are no longer the staple they used to be. Winter flounder are in decline. Of course, we have nobody to blame but ourselves. Years of commercial and recreational abuse did these fisheries in. Climate change has been no help either. 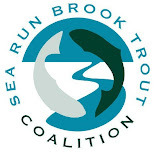 Some of the Old Guard will recall tails of 30lb Pollock in November, night fishing for cod on Rhode Island and Massachusetts beaches, and catching copious amounts of tomcod in the bays of Connecticut, New York, and New Jersey. But the last few generations of anglers have little knowledge of these things. 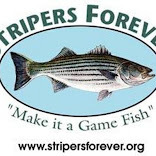 The number of angler days in the surf between NYC and Bar Harbor from December till the end of February is undoubtedly minute. But there are some fish out there. So, today, Noah and I embarked on the start of a quest to catch something new from the clear, cold inshore waters of southern New England in late winter. This will be a tedious quest. The chance is there that we catch nothing at all. We are starting from basically no knowledge. I have no doubt that we will learn a lot in this quest, and hopefully it will lead us to one or two or maybe even more new species. Noah almost became a Florida resident this winter. It's a funny thing. Within a week he has gone from fishing for spanish mackerel in 80 degree weather to targeting tomcod and skates in 35 to 43 degree weather. That's contrast. Today we were basically scouting. We've got a tiny remaining window for the tommycod before they leave the inshore waters of the sound, so that was our initial focus. The first spot was dead, excepting weird orange jellyfish we had never seen before. In the second spot I actually got one definite fish take. What it was I will never know for sure. Perhaps I should add, we were both bait fishing. I fully intend to target these species with the fly, but coming from such an uninformed position, I needed to collect as much data as possible before attempting to catch these species in probably the hardest way possible. Squid was our bait today. Clams and worms will likely be employed as well in the near future. Without any confirmation of the presence of tomcod, we switched gears and went to an area where I thought skate might be possible, though we'd still be in possible tomcod habitat. We set rods out on the jetty and watched from the van to stay out of the wind. We had no signs of interest in our bait at all, but the cove was far from lifeless. There were hundreds of gulls and water fowl of a few different species. The fourth and final spot we fished was a place I had seen a skate two winters ago, and Noah and I both seen a number of strange fish we couldn't identify there in the winter. Alas, in contrast to many of the times I have fished there, it was dead. Tired of fighting the rocks and loosing gear, we called it a day. This is just the beginning. Noah and I will be haunting the surf zones in CT and RI for the rest of the year, and the next 40 days hold promise for some of the more unusual fish of the year. We just have to put our time in, especially since we're starting late in the season. It's something anglers did a lot up until about 30 years ago. It's not a new pursuit. But it is for Noah and I. Sometimes, I've only got a tiny window of time in which to make an outing. I've been fishing the area around my home for a while now though, and I know how to make things happen. The other day I had a little bit of time in the late afternoon. I wanted to get one fish. I wanted it to be a wild brookie between 6 and 10 inches. no bigger no smaller. And I wanted it to be on a dry fly. I rode to the stream. I looked at the time when I got there. 3:42. If I didn't have my one fish by 4:00, I was out of there. I rigged up my rod and tied on a Sturdy's Fancy. I made a few casts in a shallow flat that occasionally has fish first. I expected nothing and got nothing. I carefully got myself in position to cast onto the pool where I knew I would get a fish. I methodically increased my cast length, covering the water I had caught countless brook trout in before. Then I got a rise immediately after a twitch. I missed. Or maybe the fish did. It wouldn't come back for the Sturdy's. I changed to an Ausable Bomber and the fish took again. I didn't miss it. It was a wild brookie of about 7 inches. I photographed it in the water, then removed the hook. I looked at the time. 3:58. I went home. This was a better ice year than some here in central CT, but I didn't get out quite as much as last year. We've still got safe ice down here, but the amount of open water and rotted ice is increasing. How much more I'll get out on the ice I don't know, maybe a time or two. But the more open water there is the more I prefer to just fish the open water. So now is as good a time as any to summarize my ice season. I wanted to get walleye. I wanted to get carp. Well, I got one. I got a fair number of perch this year but the majority were quite small with the exception of this mighty yellow chunker that ate my jig right in the hole. Bluegills remained the place holders. I may not be the most adept ice fisherman, but I can catch bluegills and small largemouth bass consistently. I endured some harsh conditions on the water this winter. One day, Rick and I went out hunting crappies with the cold wind making 14 degrees feel about 5. His shanty kept us comfortable but we just couldn't find the fish. On another night I got walloped by a crazy snow squall, and things went from very comfortable to a little dangerous in seconds. By the time I got home, the snow and wind had already subsided. That may very well be that. I don't know. I'm more in the mood to get some large late winter brown trout and target strange saltwater species than I am to go ice fishing a bunch more. But the weather may dictate those moves. The Eastern North American forest is not what it seems. If wilderness is defined by an absence of human change, scant few small places in the northeast can truly be called wilderness. less than 1% of the eastern forests are the same old growth that should be here. 99% of the east was cut at some point, and has since been replaced either by urban sprawl or second-growth mixed forest. Man came and decimated the North American forest, then sort of let some of it come back, though with the addition of new plants and animals. What we are left with in CT are places that are wild, but are not wilderness. It takes but an hour's walk to tell the story. Stone walls that once delineated property lines still stand everywhere, in various states of decay. Parcels that stopped being farmed later than others boast relatively new growth, young trees packed so tightly together that one can barely attempt to walk from one side of a re-claimed farm field to the other. In other places, white pine was planted intentionally in a grid like pattern, creating very unnatural feeling tunnels between the lines. What the woods of the Northeast were like when the puritans first arrived here is something I can barely imagine, because we left none of it untouched and didn't do a particularly good job of learning about what we were destroying. This isn't to say that the humans already here weren't having lasting impacts on the forests... indeed they were. Native Americans were not perfectly in balance with nature. In fact, Native Americans were doing things almost akin to slash and burn well before we got here. They cut forest to farm. They burned forest to enhance hunting. They favored trees that produced useful goods over trees that didn't. They cut large areas to live in and develop in their own manor. By the time most European settlers arrived the native population had been killed off by disease brought by the first rounds of explorers, and the changes made by the previously much larger populous had already started to be hidden by new forest growth. Of course, nothing those native peoples did remotely compares to the destruction wrought by industry. If you think about it, it is quite miraculous that genetically diverse populations of native fish survived, and that we didn't destroy riparian zones and fluvial habitat to the extent that non-native salmonids wouldn't be able to survive here. One of the key ingredients in the survival of wild trout streams in CT are hemlocks. They aren't necessary: I have come across a number of healthy wild brook trout streams without hemlocks. But most good streams have them. Hemlocks provide year-round shade, and that really is the key. Beyond being a sign of a good riparian habitat along freestone streams all around the East, hemlock tend to make up my favorite types of forest. Hemlock don't shy away from steep terrain or rocky ground. The cool, moist shade they provide hosts all sorts of lichens, mosses, and fungi. Mountain laurel and rhododendron often aren't far off. Ferns may be numerous, some of them evergreen. I adore mixed forest with lots of hemlock and steep, rocky terrain. It should come as no surprise that the presence of such forest is much of what made me fall in love with my home river. Last week, Mark Alpert and I found ourselves on another CT watershed with a lot of hemlock, moss, and mountain laurel. And it was unsurprising that the streams those woods were concealing held wild trout. Though Mark used to fish the large of the two streams when he was in school, he had never fished this stretch. I had never fished any of it, and neither of us had fished the tributary I really thought would be a gem. Actually, we had started the day further west in a stream with brown water and way too much ice. Knowing when to leave is a good skill to have. The walk in to the new spot was a bear compared to many walks to CT streams. Large tracts of preserved land have kept this area relatively wild, though it has had it's problems with water usage. There was no direct trail and the hill was long and steep. It felt good to have to work a bit to get to the stream but them actually be able to fish it, unlike the stream Alan and I had tried earlier in the week. Of course, we discovered later that we easily could have entered from a much closer parking location. I'll never regret a walk in the woods though. Especially not woods as beautiful and dark as those. The first hour or so working upriver was fruitless in terms of fish moved. There were a couple "maybes", on "probably", and a bunch of "I thought it was for a second"s. But then I hooked up. Somewhat to my surprise, it was a holdover rainbow, which threw the hook not long after it started to fight. By that point I was already right at the tributary I wanted to explore, so up it we went. Brook trout were expected, and they were in there. I got a little brown too, which wasn't out of the question but also not what I expected. Satisfied that this was a stream to come back to during the spring, we went back downstream and plied the dark, cold water river a little more. Immediately above the tributary was a long pool with a great run dumping into it. Somewhere in the middle, I stuck a large fish. I was pretty excited with the thought that this could be a quite large wild brown trout. I'm not going to lie, I was a little disappointed when the pale color and bent dorsal revealed it to be a holdover. It was a nice fish, regardless. Then, in the same run I had lost the rainbow in, I found what I was looking for. I now had two streams to add to my list, and two streams I definitely need to come back to, both cloaked by the shade of hemlock. Home means different things to different people. Too me, home is a specific small mountain stream in Eastern CT, sheltered by hemlock and laurel and hidden in a steep walled canyon. Dace, fallfish, sunfish, and wild brown and brook trout swim in its dark, turbulent waters, and only a handful of anglers will ply those waters during the course of a year. My home isn't the most hospitable. Summers bring warm and low water and trout hiding under rocks. Winters bring extremely cold water, shelf and anchor ice, and blow outs the take down trees and scour the banks, forming ice and log jams, moving huge rocks and changing the shape of the stream in mere hours. There have been winters during which I haven't been able to actually fish my home river for as much as two months. There was just too much ice to make it worth it, or even too much snow to safely get to and from the stream. This winter, though, has provided me a number of chances to fish. The water was still cold and the fish very much in winter mode, but I know this stream and I know it's fish. I also know how to approach and present flies to where the fish are holding. And I know that no matter how well I fish, I'm not going to catch a lot of trout despite covering a lot of water. But the ones I do catch are usually going to be of above average size. This post includes photos from three different trips out of six I made in January and February. In all six trips combined I caught a dozen wild brown trout. All 12 were larger than eight inches. A few were larger than a foot in length. Because of its location and structure, my home water stays far colder than many streams. A general assumption is that liquid water must be above freezing, but this is not the case for moving water and this plays a part in fish handling. Ever get ice in your guides when you know the air temperature is above 32 degrees? I have. This happens when the water is below 32 but won't freeze because it is in motion. The water pauses long enough in you guides and on your line that the crystallization process is catalyzed. It is important to keep with in mind when handling fish, because the moment you take a fish out of water that's just below freezing and that water stops moving it will crystallize on the fish's skin, fins, and gills, and it may prove fatal. If you are getting ice in your guides, if you see ice forming on rocks on the bottom of the stream in fast water (anchor ice), or if you take the temperature of the water and its between 31 and 33 degrees, don't remove the fish from the water for more than one second no matter how warm the air is. A few of the bigger and more colorful trout I caught during these trips were caught during tines when I knew the air was above freezing, but I was still getting ice in the guides. I didn't even remove those fish from the water to extract my hook. I either let them shake it or poked it out with my rod tip. I am so careful now largely because I wasn't in the past. When it was pointed out to me I felt the ones doing so were trying to clarify their superiority, and I didn't react in a way I am proud of. I know now exactly why I was criticised. I was being provided with information, not being put down. That information has undoubtedly lead me to kill fewer fish that I didn't want to. It is for fish like the one below that I put up with iced guides, leaky waders, shelf ice, cold hands, frequent tangles, and being forced to do nothing but fish extremely heavy nymphs. Panning for gold in the dead of winter is taxing, but when it pays, it is really special. Winters at my home are often strenuous. But I wouldn't have it any other way.